In the last 30 years there have been dramatic changes in electrical technology--yet the length of the undergraduate curriculum has remained four years. 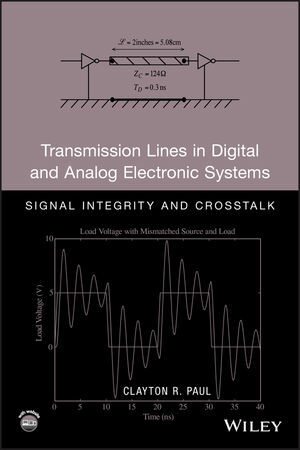 Until some ten years ago, the analysis of transmission lines was a standard topic in the EE and CpE undergraduate curricula. Today most of the undergraduate curricula contain a rather brief study of the analysis of transmission lines in a one-semester junior-level course on electromagnetics. In some schools, this study of transmission lines is relegated to a senior technical elective or has disappeared from the curriculum altogether. This raises a serious problem in the preparation of EE and CpE undergraduates to be competent in the modern industrial world. For the reasons mentioned above, today's undergraduates lack the basic skills to design high-speed digital and high-frequency analog systems. It does little good to write sophisticated software if the hardware is unable to process the instructions. This problem will increase as the speeds and frequencies of these systems continue to increase seemingly without bound. This book is meant to repair that basic deficiency. CLAYTON R. PAUL has been the Sam Nunn Eminent Chair in Aerospace Engineering and a professor in the Department of Electrical & Computer Engineering at Mercer University since 1997. He is an emeritus professor in the Department of Electrical Engineering at the University of Kentucky, where he taught for twenty-seven years. 1 Basic Skills and Concepts Having Application to Transmission Lines. 1.1 Units and Unit Conversion. 1.2 Waves, Time Delay, Phase Shift, Wavelength, and Electrical Dimensions. 1.3 The Time Domain vs. the Frequency Domain. 1.3.1 Spectra of Digital Signals. 1.3.2 Bandwidth of Digital Signals. 1.3.3 Computing the Time-Domain Response of Transmission Lines Having Linear Terminations Using Fourier Methods and Superposition. 1.4 The Basic Transmission Line Problem. 1.4.1 Two-Conductor Transmission Lines and Signal Integrity. 1.4.2 Multiconductor Transmission Lines and Crosstalk. PART I TWO-CONDUCTOR LINES AND SIGNAL INTEGRITY. 2 Time-Domain Analysis of Two-Conductor Lines. 2.1 The Transverse ElectroMagnetic (TEM) Mode of Propagation and the Transmission-Line Equations. 2.2.2 Lines of Rectangular Cross Section. 2.3 The General Solutions for the Line Voltage and Current. 2.4 Wave Tracing and Reflection Coefficients. 2.5 The SPICE (PSPICE) Exact Transmission-Line Model. 2.6 Lumped-Circuit Approximate Models of the Line. 2.7 Effects of Reactive Terminations on Terminal Waveforms. 2.7.1 Effect of Capacitive Terminations. 2.7.2 Effect of Inductive Terminations. 2.8 Matching Schemes for Signal Integrity. 2.9 Bandwidth and Signal Integrity: When Does the Line Not Matter? 2.10 Effect of Line Discontinuities. 3 Frequency-Domain Analysis of Two-Conductor Lines. 3.1 The Transmission-Line Equations for Sinusoidal, Steady-State Excitation of the Line. 3.2. The General Solution for the Terminal Voltages and Currents. 3.3 The Voltage Reflection Coefficient and Input Impedance to the Line. 3.4 The Solution for the Terminal Voltages nad Currents. 3.6 Voltage and Current as a Function of Position on the Line. 3.8 Power Flow on the Line. 3.9 Alternative Forms of the Results. 3.11 Effects of Line Losses. 3.12 Lumped-Circuit Approximations for Electrically Short Lines. 3.13 Construction of Microwave Circuit Components Using Transmission Lines. PART II THREE-CONDUCTOR LINES AND CROSSTALK. 4 The Transmission-Line Equations for Three-Conductor Lines. 4.1 The Transmission-Line Equations for Three-Conductor Lines. 4.2.1 Wide-Separation Approximations for Wires. 5 Solution of the Transmission-Line Equations for Three-Conductor Lossless Lines. 5.1 Decoupling the Transmission-Line Equations with Mode Transformations. 5.2 The SPICE Subcircuit Model. 5.3 Lumped-Circuit Approximate Models of the Line. 5.4 The Inductive-Capacitive Coupling Approximate Model. 6 Solution of the Transmission-Line Equations for Three-Conductor Lossy Lines. 6.1 The Transmission-Line Equations for Three-Conductor Lossy Lines. 6.2 Characterization of Conductor and Dielectric Losses. 6.2.1 Conductor Losses and Skin Effect. 6.3 Solution of the Phasor (Frequency-Domain) Transmission-Line Equations for a Three-Conductor Lossy Line. 6.5 The Time-Domain to Frequency-Domain (TDFD) Method. Appendix. A Brief Tutorial on Using PSPICE.